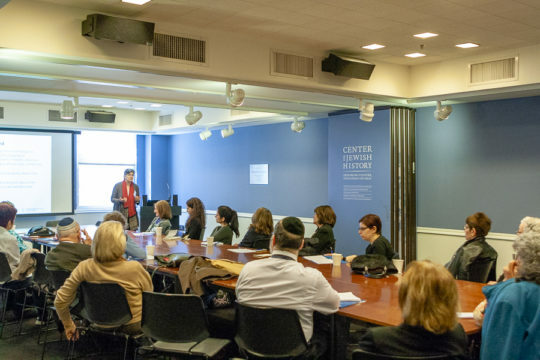 In celebration of its 60th anniversary, Yeshiva University’s Wurzweiler School of Social Work convened close to 100 social workers and other health care advocates on April 13 for a conference titled “Social Work in Challenging Times” at the Yeshiva University Museum. 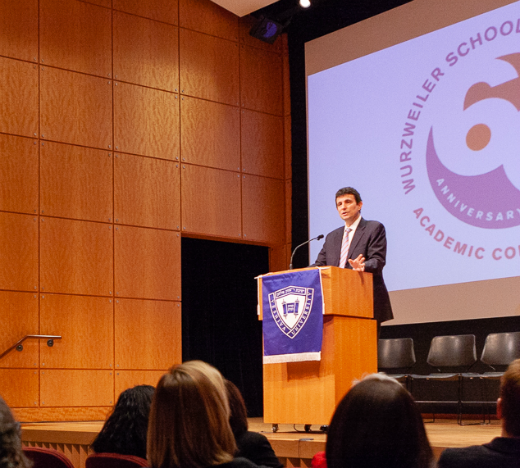 The keynote speaker was David Remnick, writer, journalist and editor of The New Yorker, and the conference featured three workshops on the impact of recent events on the fields of medicine, mental health and immigration. 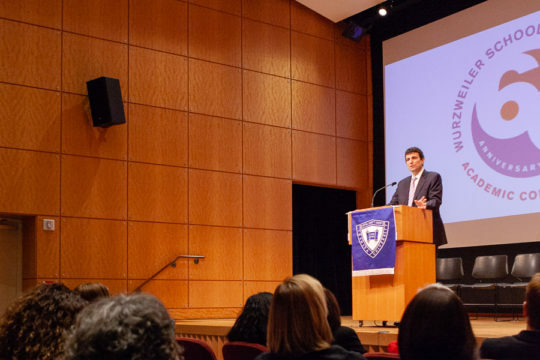 David Remnick spoke about free press in the era of President Donald Trump. Cardozo Professor Lindsay Nash (left) discussed challenges facing immigrant families applying for asylum in the United States. 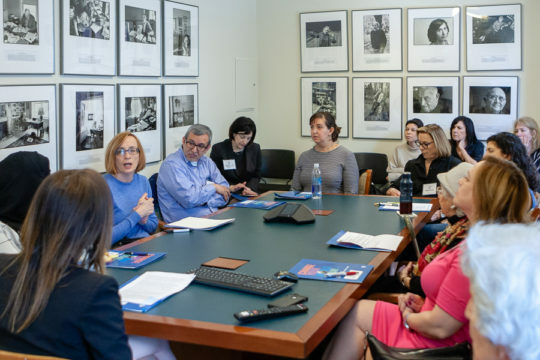 Dr. Penny Damaskos, director of the Department of Social Work at Memorial Sloan Kettering Cancer Center, discussed the adoption by hospitals of the principles of patient- and family-centered care. Lindsay Nash, visiting assistant clinical professor at YU’s Benjamin N. Cardozo School of Law, works with immigrant families applying for asylum in the United States. One of the great challenges, she noted, was getting these families, who are often traumatized, to tell their stories in a way that will convince the government officials to grant their petitions. On a recent trip to family detention centers in Texas, she was accompanied by Dr. Katherine Mitchell, associate professor at Wurzweiler, and current Wurzweiler student Domenica Galati-Scoles. “The work they did, as social workers, to get the people comfortable enough to tell their stories, can only be called magic,” Nash observed. “We need to do more of this collaboration with social workers because if our families can’t tell their stories, they will not be granted refuge.” The main challenge now is finding the funding to build a stable collaboration between the two schools. The conference was dedicated to the memory of Dean Carmen Ortiz Hendricks, the first Latina dean of a New York school of social work, who led Wurzweiler from 2012 until 2016.